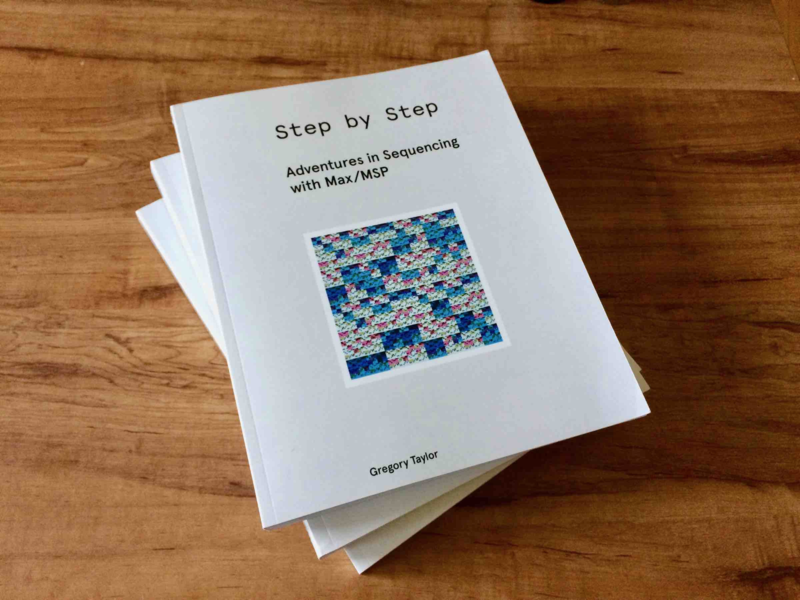 This week marks the appearance of something a little different from Cycling ‘74 - a Kindle book (available as print-on-demand) that takes the creation of step sequencers using Max as its subject: Step by Step: Adventures in Sequencing with Max/MSP. Gregory Taylor usually wrangles and contributes to the weekly newsletter, so interviewing himself wasn’t an option. Brad Garton, who heads the Columbia University Computer Music Center, was one of the book’s early readers, so we approached him about putting a few questions to Gregory that won’t spoil the fun of discovering what’s in the book. Our thanks to Brad Garton for asking those questions. What was the genesis of Step by Step? It’s got several sources. A number of years ago, I wrote a series of LFO-based tutorials - they turned out to be wildly popular (I still collect the occasional free pint from a grateful reader, to this day), and - when I tried to ask people why - one of the interesting responses was that readers enjoyed watching as a patch was modified to extend its usefulness or seeing it used in another context. It’s so common to see a video or a posting with a cool Max tutorial in it that’s sort of a semi-finished work - it does something amazing and inspiring, and then it stops there. You also notice that the comments following the video or tutorial almost all come from people who want to change or repurpose what they just saw. Once I started thinking about that, it just clicked in with a bunch of ideas I’d had rattling around in my head already about certain kinds of writing about Max that we don’t see as often – one of which had to do with trying to describe how Max programmers approach larger projects or bigger ideas. Again - think of the Forum postings you read - it’s incredibly common to see a beginning user posting about something they want to do in such a way that suggests that – while they have an idea in mind – they’re far less certain about how to approach the problem. So I was wondering about some way to describe how Max programmers approach the idea of patching larger projects. Of course, there are about as many ways to break a bigger problem down as there are Max programmers – but since I was doing the writing, I just started from the kinds of patching I did. Why did you decide to write about step sequencers in particular? I had this idea about a kind of a book but I didn’t have a subject or a specific kind of Max patch. So I went and asked around a bunch. Since we’re talking Max, lots of the answers were all over the place: VJ rigs, loopers, softsynths, and so on. But there was also a steady stream of requests for patching related to the humble step sequencer, and what interested me was that these requests came from people with slightly different interests: People who wanted to build Max patches, analog synth folks looking for ways to integrate Max into their practice, and Max for Live users, too. So I wound up deciding to focus on the humble step sequencer. It was a fun choice for me, personally. 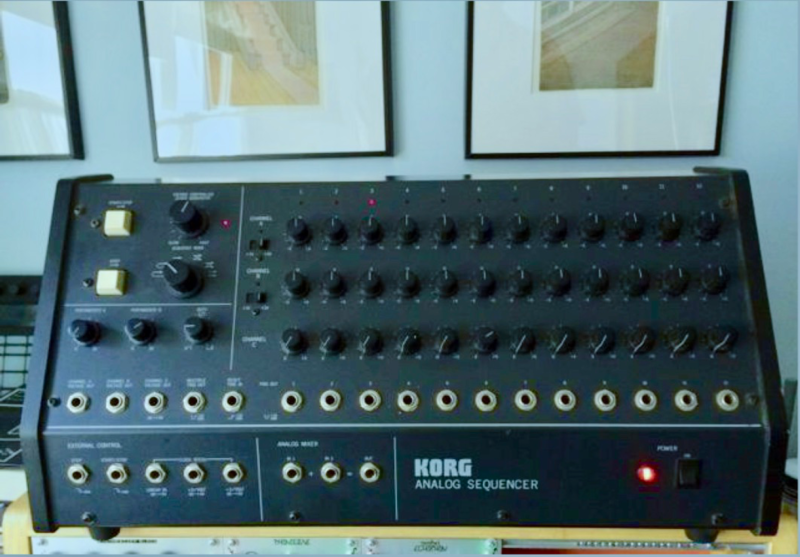 We’ve all got stories about “my first step sequencer,” I think. Mine was a Korg SQ-10 that I bought on my way out the door at the home of a guy who had a Korg MS-20 synth that he wanted to unload. I’d paid him for the MS-20 and spotted the SQ-10 sequencer leaning up against the wall as I was leaving. When I asked him about it, he decided he really didn’t have a use for it now that he’d sole the synth, so he asked me for 20 bucks for it. Naturally, I did not refuse. It’s been with me ever since. In the course of these conversations, I realized that nearly everybody had slightly different objects of sequencer affection, and their interests/requests about functionality were all just slightly different, too. In addition, newer ideas such as Euclidean sequencing wound up coming up, too. So the subject just seemed perfect as a Max patch to build the book around. And that’s how Step by Step was born. How do you think the book should be used? One of the things I consciously did in the book was to not make a finished product; the book is full of examples that follow from the initial “simple” step sequencer patch and build some kind of different functionality into a specific part of it. If I’ve done my job well, I hope that readers will be confident enough in the explanations I’ve given them to make something of their own based on the various ways to extend the basic sequencer patch that opens the book by swapping out parts from the different chapters. I guess that might include students, since I suppose this could be a reasonable intermediate text of sorts. Maybe I should have created a “Teacher’s Guide” with homework assignments. Oops…. While some serious math student could calculate the number of possible step sequencers that could be made from all those little parts, what would make me happiest would be readers who find a combination they like, and that they feel comfortable reconnecting the things they think are important. Was there anything about creating Step by Step in particular you hoped to accomplish? It’s tough to tell someone what they ought to do with what you make or give them, and even tougher to expect people to be excited about the same things that interest you. I hope that readers will manage to pick up on the fun that I had making the patches, and I would hope that readers will notice that I spend a lot of time talking about using a pretty small number of Max objects to connect and recombine various bigger parts of the patch - trigger, the zl objects, $ syntax in message boxes, and that kind of stuff. Being comfortable with those humble message-massaging objects is the heart of the way I’ve come to work, and I’d hope that their importance comes through. Another goal for the book for me was something I hadn’t previously written a lot about that I thought I’d always underrepresented in writing about Max: focusing on what I think of as programming between objects. That’s interesting. Could you explain that a little further? It’s the simple idea that we often find ourselves working with two Max objects with quite a lot of built-in abilities that don’t obviously talk to each other. Learning to take output from one object and massage it so that it controls stuff in the right order or gets translated in some way so that the receiving object can use that information to do something cool is something that Max programmers do all the time. Back in the day, I used to do workshops whose intention was to teach absolute beginners how to use Max. In the course of developing those workshops and trying to help beginners get accustomed to making art by sending messages back and forth between a small set of those initial objects, I found my own patching styles changing – focusing on using that small number of Max objects that provided simple ways to receive and manipulate messages in Max gradually simplified my own Max patching. My patches are sure easier for me to read when I go back to them after time away, so that’s a big win for me. 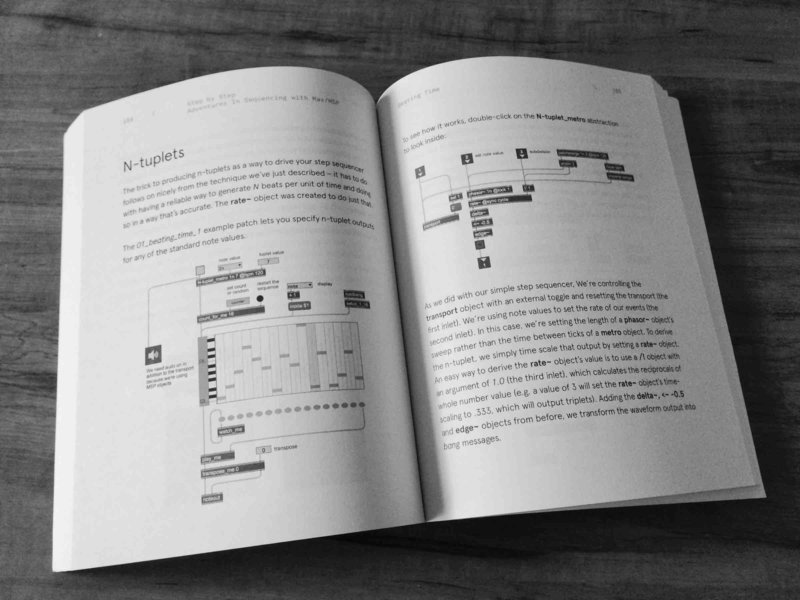 How has writing the book changed your perspective on Max/MSP? No softball questions here, huh? In my own patching practice, I probably spend more time patching and fussing over the “instrument” I’ve built in Max/MSP than I do thinking about Max as a tool. It might sound silly, but - even as someone who works for Cycling ‘74 - the appearance of Max 8 was really really exciting because of new features that allowed that change of perspective. I’ve constructed my live performance rig over many years, and it’s been a gradual process of trying out new things for a gig or a session or six, and then keeping or pitching or modifying the stuff yet again. Having to pull the patching together in a pedagogical sense for Step by Step required that I move away from that mode of working - it got me thinking in a more explicit way about what a small set of tools I could reuse the emphasize for the reader could be used over and over again to achieve different ends. Writing the book reminded me again of the pleasure of sharing the act of patching with others in a way that lets them imagine a future for themselves. Finally, the first time I sat down to write a walkthrough of the simple step sequencer patch that starts the book, something occurred to me: Nearly all of the changes I’d made to it along the way had to do not with modifying the entire patch, but with extending the smaller units as I went along the way - working quickly to create interesting and, I hope, simple solutions that did interesting things. I was reminded again that that’s a better way to work than I normally pursue. I was particularly struck by the implicit communication of your own creative process in the text, and I would love to see something more explicitly surveying that territory. The exciting work that my colleague Rob Ramirez has done to make a texture-based version of Vizzie possible has excited me no end and makes me think there might be some interesting work to be done that had Vizzie at its center. And I’ve got a follow-on book to Step by Step in my head, too. My own work as an artist is sort of a different matter, but one also closely related to what’s in Step by Step. When I finished the recording that I made while living abroad in the Netherlands in 2017 (Randstad), I had the sense that returning to the solitary business of doing solo recordings was really stressful – I had real trouble surprising myself, and it was really only in the process of struggling with Randstad that I realized how I’ve come to find comfort and to rely the exchange of playing in ensembles with friends as a crucial spur to new things. While I was proud of Randstad as a finished product, I realized, too, that it might represent the end of that way or working, and that I should be thinking about developing different tools and different ways of working when I worked alone. It probably won’t surprise you to discover that the patching I did for the book represents not only work on the subject, but also my exploring what new combinatoric forms I might pursue going forward. I’d say that the seeds of my next solo recording live in the book – and that the ideas that will inform any follow-on writing to Step by Step are probably involved with the patching that I’m quietly pursuing right now..
Really exciting interview and I can't wait to get the book. Congratulations to Gregory.. and thanks for sharing all your hard-won knowledge! I'm really glad to see this book coming. Ordered the paper version, looking forward to playing with it!